When severe weather hits, alerts start coming in left and right from and it can get confusing. So, what is the difference between a Tornado Watch and a Tornado Warning issued by the National Weather Service? TYLER, Texas — When severe weather hits, alerts start coming in left and right from and it can get confusing. So, what is the difference between a Tornado Watch and a Tornado Warning issued by the National Weather Service? Tornado Watch: Be Prepared! Tornadoes are possible in and near the watch area. Review and discuss your emergency plans and check supplies and your safe room. Be ready to act quickly if a warning is issued or you suspect a tornado is approaching. Acting early helps to save lives! Watches are issued by the Storm Prediction Center for counties where tornadoes may occur. The watch area is typically large, covering numerous counties or even states. 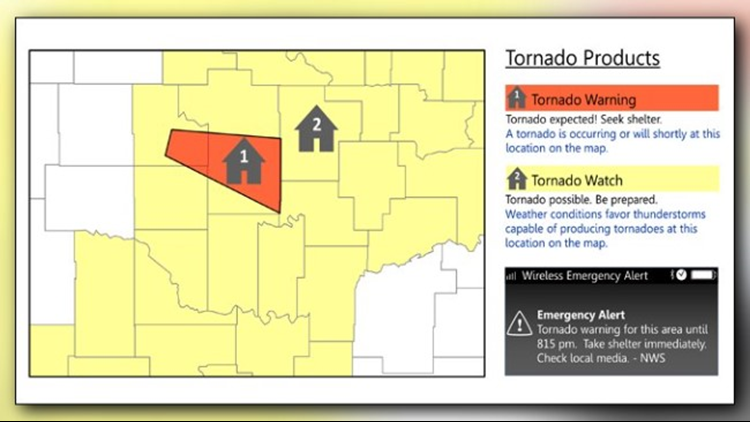 Tornado Warning: Take Action! A tornado has been sighted or indicated by weather radar. There is imminent danger to life and property. Move to an interior room on the lowest floor of a sturdy building. Avoid windows. If in a mobile home, a vehicle, or outdoors, move to the closest substantial shelter and protect yourself from flying debris. Warnings are issued by your local forecast office. Warnings typically encompass a much smaller area (around the size of a city or small county) that may be impacted by a tornado identified by a forecaster on radar or by a trained spotter/law enforcement who is watching the storm.